I <3 my new keyboard. Hey its not anything fancy, but it is 100% better than my first one. My new keyboard is a Microsoft Confort Curve 2000. It is very quiet when typing and has some nice function keys at the top (Volume, Play/Pause, Back/Forward, Web, Search, Mail, Calculator). I also like the fact that it is full-sized (my old one wasn't). i have a very basic keyboard/mouse combo and i love it. Looks like it from the picture. Nice Keyboard, i have a logitech MX5000 Desktop, but the bluetooth messes up two a week at least. That looks really cool, but I bet it's really expensive, isn't it? 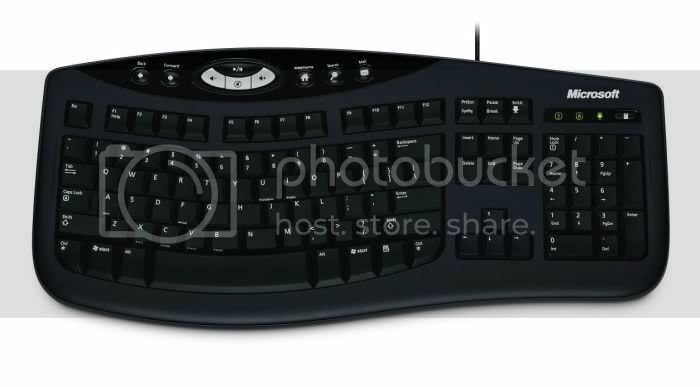 I am using a Logitech UltraX Desktop (a black wireless keyboard and mouse combo). I especially like the flat keys on the keyboard, they feel like a notebook keyboard. That thing must be like $1000!?! But it would be sooooo awesome to have. You better have that thing locked tightly to your desk, or you might find it magically disappeared when your friend came over . I really love this thing. I got it a few weeks ago and the reason I love it so much is because it looks and feels like a laptop keyboard, and I love laptop keyboards. There is something satisfying about the clicks that they make. The above post is brought to you by me not listening in class and posting here instead. Is that a Logitech diNovo or something like that? I have a Logitech UltraX desktop (as said before) and I also love the notebook style keys and their "clicks". Last edited by empireum on Mon Oct 23, 2006 9:35 pm, edited 1 time in total. I like it, seems to be a nice one. My UltraX is great as well, but I dislike the mouse because it really drains the batteries... Have to replace them every few weeks but the keyboard still has the original ones... Is your diNovo a bluetooth model? How's the battery life? No, it's not a bluetooth model. I don't use the mouse that it came with either because it's not very ergonomic, but I bought it for the keyboard anyway and I already have a good mouse. As for battery life...I've only had it for a few weeks now so I'm not sure. The keyboard took 2 AAs, the number pad took 2 AAs, and the mouse took 2 AAs, but I don't use the mouse so those batteries were pretty much an extra. Got a great deal on it too. It was like originally $99, on sale at J and R for $80, with a $30 MIR, so I payed like $55 for it after shipping or taxes (can't remember which). I've got some cheapo Logitech OEM "Deluxe Keyboard", nothing special, but it types alot better than my old second hand Dell keyboard.. I have a Microsoft Basic wireless kit, keyboard and mouse. Now covered in tea stains, bits of food, and god knows what else, lol! Really? I've had my MX5000 for almost a year now and I haven't had one single problem with it. I love my MX. "Stupid can opener! You killed my father, and now you've come back for me!"